Day 18 for me. I had to stop and think about what day I was on. Things have kind of dipped down for me. My tummy is still aching yesterday and today. Yesterday it hit a couple hours after lunch and today a couple hours after dinner. Why?? Peppermint tea is a staple for me now. My sleep has gotten bad again. Some nights I've stayed up as late as 1:00 am and sleep fitfully. Well, enough with complaining. I am grateful for all the hard work I've put into meal prepping. It makes my mornings so easy and I have wonderful, nutritious meals 3 times a day. I went to a pool party tonight where they served southern comfort food and I didn't eat a single thing. I will wake up tomorrow feeling fresh and motivated instead of crappy and bloated. Keep up the good work everyone! We are coming up on 2/3 of the way done. Hello Juner's! I started June 1st, but this is my first forum post/ forum reading. Love the idea of a group to check in with, so not sure why I didn't think to look for forums previously, lol. First two weeks have gone well, with planning meals and grocery shopping being key. I bought two watermelons from different places this past week, and both were bad...that really put a kink in my plans! I moved forward with my go to lunch, anyway, though...Pan seared chicken breast, avocado, and diced cucumber. Yum! Any gardeners out there trying to use fresh and seasonal produce? I'm in 6A, and we have had a lot of rain and high temps...my lettuce is bolting, and don't have yellow squash yet (hopefully this weekend). Would love to try and be completely Whole30 on a local scale, but not sure if that is a feasible goal! Looking forward to going back and reading about all of your journeys to get to this point, Day 20! Hey, I'm not sure what all tummy troubles you are having, but have you every tried natural calm magnesium? You can get a compliant non-sweetened version and it helps you sleep. It also gives you diarrhea if you take too much at the beginning, so they recommend starting with half a dose and working your way up. Might help with your sleep problems? I have always had a lot of trouble sleeping, so I feel your pain. And congrats on making it through that party unscathed! Day 17 for me. Last night I almost gave in. I went to a nephew Bday party and they had pizza!!!!! I really really wanted a slice. Instead I just sniffed it (so dumb I know). Don't even ask about the bday cake they had. BUT I didn't have anything I couldnt. I stuck to the salad and ate protein when I got home. I have a question. I usually have a good smooth complexion. But lately I have been getting pimples and my skin is dry and flaky. Does anyone know anything about this? @Brocha I wish I could help but my skin is usually the first thing to improve. It sounds like it could be just your skin releasing some of the junk from your system but I’m not sure about the dryness. It’s usually dehydration for me but it seems like skin is one of those things that swings wildly different by person. Welcome @ThisAgrarianSoul I have a very small patio garden with mostly herbs. This time I’m trying some peppers but no crop to speak of so far. My favorite herb is Pineapple Sage. I would love to find some good ways of using it this summer. So for burger night I tried to do a BLT version. I took some sundried tomatoes and crisp bacon and some dill/garlic/onion/herb blend and mixed it with some mayo. I meant to wrap that all in lettuce leaves for the L part, but I forget to pick some up so I did a handful of micro greens. Unfortunately for me it ended up huge and my appetite is totally MIA tonight. I’m going to try to make it through at least half but I’m laughing at myself for ending up just staring at it and wishing for something lighter. My idea, lol. I can tell I’m truly not hungry because even the paprika/chili sweet potatoes aren’t tempting me and I usually love those. I hope everyone is excited to slide into the final countdown! OMG @Crimsann that looks so good. Good work! Lucky you, you can eat the rest tomorrow. I'm on board with burger night, but I'll probably do it tomorrow night, unless I get hungry enough for 2nd dinner, which is entirely possible. I've been really hungry a lot lately. I had a bowl of crock pot chili tonight. @ThisAgrarianSoul I love your goal of doing Whole30 Local. I don't have a garden, but my sister has a crazy awesome garden system and I go over there once a week and stock up on lettuce greens and whatever else is on. It's so great! Seriously I want to eat that burger right now! @Crimsann you inspired me and I made burgers tonight! I ate 1/2 of one. It was my favorite meal I've had so far. So good I felt like I was cheating. 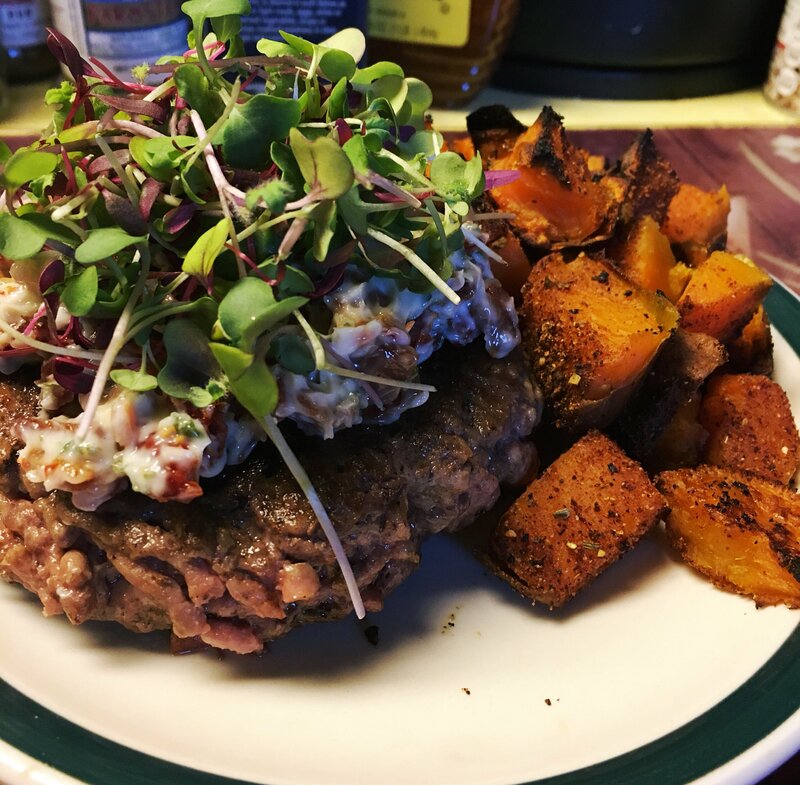 Seasoned beef patties, compliant bacon, homemade mayo infused with chopped pickles and basil leaves, mustard, over garden baby greens, and topped with the crispy shallot recipe in the Whole30 cookbook. I would have loved to add a thick homegrown tomato slice, but I don't have any. @Brocha I totally sniff the non-compliant food, and am so glad you disclosed that so I don't have to feel crazy over here by myself! My husband brought a homemade sourdough loaf home from market last Wednesday, and it smelled divine! @Crimsann That burger looks amazing! I love to top things with microgreens...Yum. It has been years since I had a pineapple sage plant, but I remember it being wonderful as an accent in floral arrangements for the house. I'll have to think about some other food uses. Might need to add that to my wish list for the herb garden again...we have moved twice since I had it. I made asian flavor pork burgers with red pepper and lettuce "buns". They were really good, and I was glad they turned out because I've never made burgers out of ground pork. I also put microgreens, spicy mayo and a little avocado. We had it with some steamed potatoes, carrot chips and a bit of fruit salad. I was out of clean plates, so we had to put the sides on a separate one. I miss eating burgers on those skinny buns, but I'm getting better at finding substitutes. Hi! I have a good sized garden, but it's getting close to time when it's finished. I live in Phoenix, so it's pretty hot. I have been harvesting zucchini, peppers and some cherry tomatoes. I have some armenian cucumbers that are starting to take off and I can't wait to start eating them. It's been nice to make frittatas with whatever I can pick. I have a lot of sweet potato leaves, but i haven't tried eating them yet - I just give them to the chickens. Have you ever cooked with them? @Plantas YES! See if I had just had that crisp looking lettuce leaf wrapper...or else it just sounds better tonight I’m not sure. For some reason either the meat I’ve gotten lately isn’t as good or something about how I’m fixing it...but with burgers they keep turning out tough even when they are half cooked. I’ve a tendency to eat things on the rarer side of medium buuuut. I’ve got to figure out what’s changed. The last few times I’ve made them its been a chore to eat them. I haven’t done much beef at all this round but I’m thinking either the always popular chocolate chili (I like to add a bit of creamy mild guacamole on top in place of sour cream..easier to pack than plain avocado and cuts the heat some if I get it too spicy) or some Salisbury Steak meatballs for next weeks lunches. Both seem to do well for reheating. One last note on burgers though...something on my Insta feed tonight got me thinking about making a hashbrown bun. That seems like a great way to have your burger and “fries” and eat them guilt free too, lol. That might be a thing I save for the 4th though. A fun way to share in the cookout mindset. I could see that being a family pleaser with none the wiser and no one missing the bread. That sounds spectacular. I HAVE to try the hashbrown bun. In fact I wish I were at home trying it now. The 4th is a perfect time to roll it out, but I'll probably practice over the weekend. The chocolate chili sounds good, and I have a lot of ripe chiles to use up. I prefer the more well done burgers, and I really don't like chunks of meat. I didn't eat meat (just fish) for about 15 years, so maybe that's why I'm funny about it now. You guys...I think today has been the hardest day. I left work early to run errands and get my hair done. I had to pass my favorite cupcake shop and I swear everyone around me was talking about bread... I managed to hang on in no small part due to the bag of berries I brought. I realize that you’re not suppose to use fruit for a sugar craving but I was like a crazed lunatic looking for my next high. Anyone have any good recommendations for better ways to handle that? I have one kind of funny and one kind of serious tip for that. During my first W30 I used to joke that if I got a craving and was just imagining some delicious taste or texture I would immediately look away and let my eyes land on the first non-food item I saw and try to imagine...just as vividly...eating that instead. This often ended up being my co-workers desk plant. I don’t know if the absurdity of it broke my concentration or if any good distraction would have worked but it at least made me laugh at myself. After the first round though cravings weren’t such an issue. I sort of attribute that to a couple of things. The true rewiring of my tastebuds, even if not complete, had begun. And once I went back to some of those foods, I can honestly say they rarely satisfied. The tastes I remembered don’t exist anymore. I’m not saying I’ve never enjoyed a cupcake since, in fact the joke on me here is that I spent all last year baking unique cupcakes for each birthday in my department. 32 different kinds. Which is part of why I’m with you this month!!!! And I’m a really good baker. But I could count on one hand the versions that really, truly, were worth it. I used to exist on bread. Inhaled it. Nearly worshipped it. But I bet I’ve eaten less than one full loaf in the last three years. Even those gorgeous artisan ones that used to make my heart sing, because every time I tried some it was just a bit meh. Sometimes it’s made me a bit sad, sometimes it’s a huge relief that the temptations are no longer so insurmountable. Sometimes I wonder if they changed all those recipes while I was eating clean and I wonder why no one else has noticed. The slightly more serious tip those is something I still use. If I find myself wanting something sweet, I reach for the opposite. It doesn’t even take close to a full serving, about three cashews and the craving is gone because that salty/fatty reality breaks the spell. Or I will end a meal with a few sips of a fruit flavored sparkling water so I’m not left with that “need” to “cleanse my palate” that is often the excuse for a dessert. I also try to keep my fruit within the meal as much as possible but I include some in every weeks meal plan. That keeps a full complement of flavors in my diet and doesn’t set fruit up as some (pun alert!) forbidden thing. Pork roast slow cooked with some papaya juice, a piece of grilled fish with some pineapple salsa, apple slices in a coleslaw blend, those gorgeous looking peach fruit only jam and fresh jalapeño glazed chicken wings I saw on Instagram the other day. The cautions about too much fruit are totally there for a reason, so my self rule has been to keep it off a pedestal and to make sure I ate it as part of meal I had planned out in advance with cool deliberation and not as an impulse or a substitute for something sweet. Keeping it on my plate at least one meal a day most days routinely seems to work for me. @Crimsann Thank you so much for your response. I love the idea of looking to something nearby and thinking about eating it Ivan see that making me laugh and potentially getting my mind off of the craving. Also having the opposite sounds like a great plan. I will try that on the next upcoming craving because I know it will happen. I feel like I coasted though the last few weeks without much thought about sugary sweets and now my sugar dragon came roaring back. Today is a new day and I’m hoping it has passed! hey how's everyone doing? one week left! it felt like forever, but I can see the finish line! I had a lot of company last week, and I navigated cookies and punch at the teen's graduation, he and Grandma's take-out dinners and desserts from the local bistro, potluck picnic dishes and desserts, and the non-compliant leftovers in my refrigerator! I didn't have much of a plan, but I faked it well, and now we're coming into the home stretch - I'm really feeling like I'm starting to get it, and it's pretty simple. so at the end of the 30 days, I'm going to do the re-introductions, and then see how I feel about continuing forward as best I can. I seriously wouldn't have made it through without two generous gifts of groceries, one from a kind commenter on this forum, and one from my mom, and I want to acknowledge their contribution to helping me succeed. I wonder what I should reintroduce first? @Crimsann - I hear you about not getting the burgers right. I messed up the hard-boiled eggs twice in a row, and it was really disappointing, because I was cooking up several, and was sorry to have wasted the food. also, both times I made burgers I had them with roasted potatoes, and also made sweet potato 'buns' by slicing from the biggest part of the veggie, and pan-frying them in coconut oil until soft on the inside and crispy on the inside. Some people suggest baking them, and I think I'll try that next time. @Plantas - I love the pepper and lettuce as a bun idea! I also swear by that method. For either type of potato, if I want to do crispy roasted potato or put out some shredded on my griddle and make hash type potatoes I always bake them first. I will do a weeks worth in the oven while doing my other meal prep and leave them wrapped in foil in the fridge then chop or shred them before roasting or, well I hate to say fry because I don’t deep fry them but I do crisp them on my electric griddle. Perfect results as far as crisp on the outside and soft inside. Especially in the griddle. Weekend breakfast if I cook my bacon that way first or beside them even I don’t need to add any oil really and double bonus they soak up some of the bacon fat and make the griddle easier to clean plus they taste fantastic. Trying to roast or crisp raw potato takes far longer and rarely turns out as well for me. It’s been another lazy Sunday. I made a pot of the chocolate chili and packed that up so lunches are taken care of...just need to finish laundry and I can truly relax for the last five minutes of the weekend. I missed going to the zoo with my nieces but final week meal prep had to get done. Well, not final week for me anyway but I still want a solid week because July is starting off with a bang. Those cupcakes I mentioned? I’m not through the full employee roster yet and I have three types to do in the first two weeks. That may be the end of it for the year though. I won’t know for sure yet because we have several new hires starting this week. We rarely add staff so once I’m sure on where they fall I won’t need to worry about another bunch coming on but it’s definitely going to pose some challenges if I’m not on firm footing. Sounds like I might have made the right choice on the zoo though because my sister says they no more than got to the parking lot to go in and the little one got sick all over the car. Mostly I felt bad I wasn’t there to help, but let’s be honest...only mostly. Hope everyone is ready for a strong finish! p.s. @ whoever was saying before that all they wanted was a cold drink? Me all day. I made a pitcher of sun tea and added some of that pineapple sage from my garden while it steeped and I’ve drank half the pitcher just today! Everyone have a good week and a great strong finish to your Whole30. I have at least 3 parties to get through this week, but I will stay strong and be prepared. I'm more motivated than ever! Just as we did a "burger night" last week, who would be up for a group exercise night? We pick a date and everyone commit to go for a walk, hike, swim, weight lift, planks on your living room floor, whatever works for you. How about Thursday night this week? @magsrose I love the idea, count me in! I’ll have to think about how to do it. My secondary goal this month was to close all three rings on my Apple Watch every day. I nearly slipped yesterday by missing a few Stand hours in the middle of the day but I did keep the streak going. I feel like to truly honor the community night though I should do something outside my typical treadmill/yoga rotation. That needs shaking up a bit anyway! Happy day 25! I think I felt the tiger blood yesterday... that or I had a manic episode I got so much sewing and yardwork done... I felt like I was in the zone. Problem was then when I went to sleep, I woke up at 3am still in the zone. So I was awake for quite a while until I finally fell back asleep. I feel like I could do this forever and I'm not sure how I'm going to reintroduce. I was thinking I might just start out with Nom Nom's strawberry/banana/coconut milk ice cream. It's a paleo-fied dessert, but I have been really wishing for something cold in this NC heat. Other than that I kind of want to stay the course for now. What are you guys' plans for day 31?